That Andy's been Googling again, thankfully not for his own name, and found an unvisited eatery within EVR (electrical vehicular range) of MH. It's one of them thar pop-up caffs and is only open in a Brigadoon stylee on Thursdays from 10am to 2pm. Hey, today's Thursday and it's already 12:30pm. Pedal to the metal, driver! 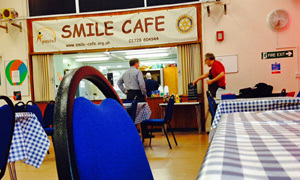 Northbound, I see from their website that the Smile cafe offers respite -- much needed -- mainly for carers and vulnerable adults. There's one of each of those in the car. Adopting my Mike Yarwood serious face, this is a volunteer-run place providing somewhere to meet for those involved with dementia, learning problems, etc. This all happens in Saxmundham, home to the rather good Trinity's and The Bistro, but this'll be a somewhat different experience. In the shadow of the water tower (and opposite the controversial "free" school) sits the community hub known as the Fromus Centre. Towards your right is the cafe itself, winding down by the time us light lunchers fetch up. Warm welcomes all round as we're offered rolls, quiche, burgers, etc. Here's a first: there's a selection of cup-a-soups on offer if that's your just-add-hot-water bag. Waiting for our grub and sipping a can of ginger beer, Andy tries his luck at the Xbox Kinect ten-pin bowling... and promptly scores a strike on his very first attempt. Before he can show off further, here's his well done bacon butty and my baked tatty, good and hot and filling. Must mention Les who mans the till, steers our food towards us, checks we're OK, opens the doors and so on. What a star. Not often a cafe is playing synthesized versions of the Godfather theme but this one is. Aided by Les, it's back to the counter to try a not-half-bad scone 'n' jam 'n' butter with a half-decent cuppa coffee. Prices are ridiculously reasonable and the folks could not be more attentive, plus they're always looking for more helpers. Need some respite? If it was a car -- SmILE Greenpeace car.